Musical Hot Dogs in Thousand Oaks! Wienerschnitzel Gone, Garage Dogs Coming! Sept 2012 Update: Garage Dogs has closed. UPDATE 4/16/12: Garage Dogs has announced it will be opening its doors on Monday, April 23rd! Recently we announced that Conejo Valley hot dog consumption would be taking a dive as the long-standing Wienerschnitzel next to the Do It Center on Thousand Oaks was completely demolished to the ground to make way for a Chick-fil-A. Well hold on to your buns as there's a new dog coming to town (and thanks to CVG reader Richie for pointing this out)! 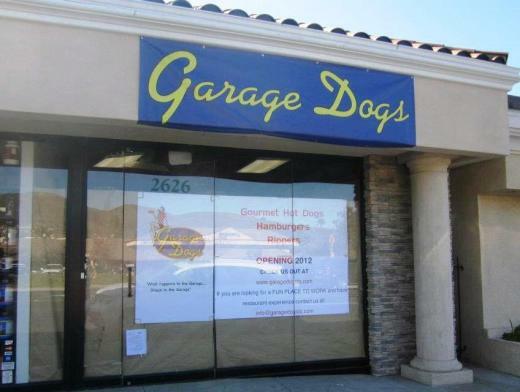 Garage Dogs is setting up shop at 2626 E. Thousand Oaks Boulevard, just 1 mile west of dearly demolished Weinerschnitzel. This is literally across the street from 24 Hour Fitness! Very convenient for rewarding yourself after the treadmills! Check out their menu at www.garagedogsto.com/menu.html. Hot dogs, sausages, rippers (I believe these are deep fried hot dogs), burgers and a nice variety of specials, like the Gran Torino ("Chicago Dog") all beef steamed dog with neon relish, onions, mustard, tomato, sport peppers, pickle spear, celery salt, poppy seed bun. I'm salivating on the keyboard. They also have turkey dogs and veggie dogs, which is nice to see.